A majority of the programmable logic controller (PLC) programs will include a counter instruction. The BRX series of programmable logic controllers have several different counters available for your program. There are five different basic counter instructions in the PLC. The memory area for counters (CT), include the Counter PVs (Present Values) Counter SVs (Set Values) and the Counter Completion Flags. The default size of the counter area is CT0 – CT255. This size can change to the amount that we need for our program. Please see BRX PLC Numbering Systems and Addressing on how to change the memory configuration of the controller. We will be looking at the counter instructions in the BRX PLC along with some programming examples. As a system integrator, this ability can prove very useful to you in the field when commissioning your automation system. When dealing with counters, we need to look at timing charts. The Secret of Using Counters is a good refresher on using timing charts. Let’s get started with the BRX PLC Counters. Do-More Designer uses differently coloured triangles in the upper left corner to show you how the instruction is used. All of the instructions that we will be discussing have a yellow (Multi-scan) symbol. The multi-scan designates an instruction that will take two or more PLC scans to complete. These instructions depend on the status of the instruction from the previous scan to properly function during the current scan. This just provides some additional information when looking at the instructions. 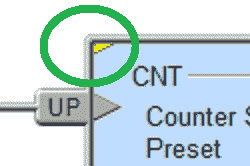 The up counter uses two inputs. When the first input (X0) transitions from off to on, the accumulator will increment by 1. Once the accumulator has reached the set value, the counter done bit will be set. The second input (X1) is the reset for the counter. The accumulator will return to zero. The down counter is similar to the up counter except that the accumulator will decement from the set value down to zero. Note: This is the exact same timing chart as the up timer above. The up / down counter has three inputs. The first input will increment the accumulator by one with a transistion from off to on. The second input will decrement the accumulator by one with a transition from off to on. If no set values are programmed then the the Done bit is set when the accumulaor is positive and the DnDone bit is set when the accumulaor is negative. In our example the Done bit will be set with an accumulator greater or equal to 3. The DnDone bit will be set with an accumulator less then or equal to -3. The global up / down counter is similar to the UDC up / down counter, except that it does not have a reset input. The reset is achieved by the RSTCT reset counter instruction. Note that you can have no set value, a preset up value, a preset down value or both a preset up and down value. You can watch the video below to see how the different counter instructions work in the BRX Series PLC. Next time we will look at high speed I/O in the BRX PLC.